March 4 (Fri) 8 to 11 pm. 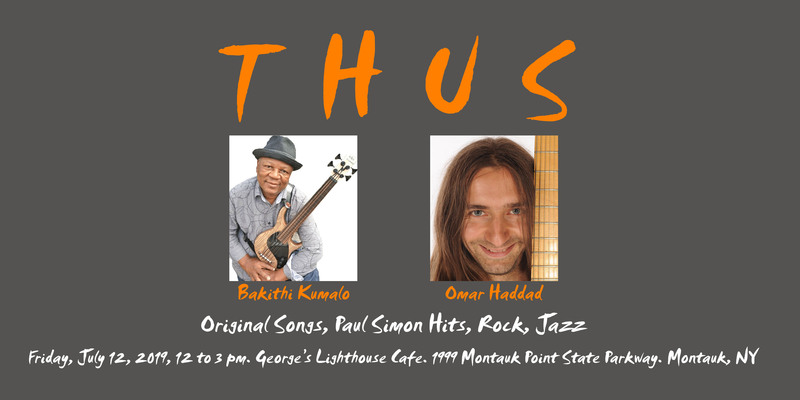 Come down to the Coast Grill to hear a reduced version of THUS, with Ben Goodale, and special guests. Hope to see you! Awesome menu and even better people. : 1109 Noyac Road, Southampton NY 11968. 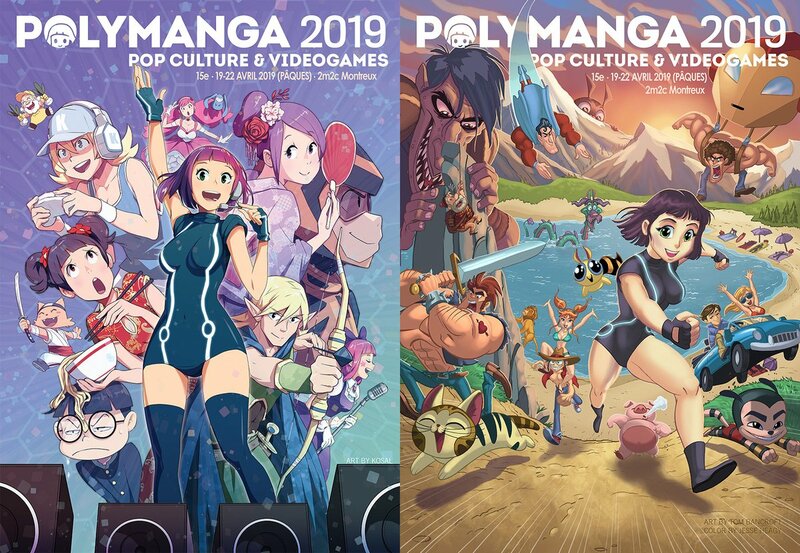 Polymanga has been the biggest event on pop culture, video games, and manga in Switzerland for 14 years! 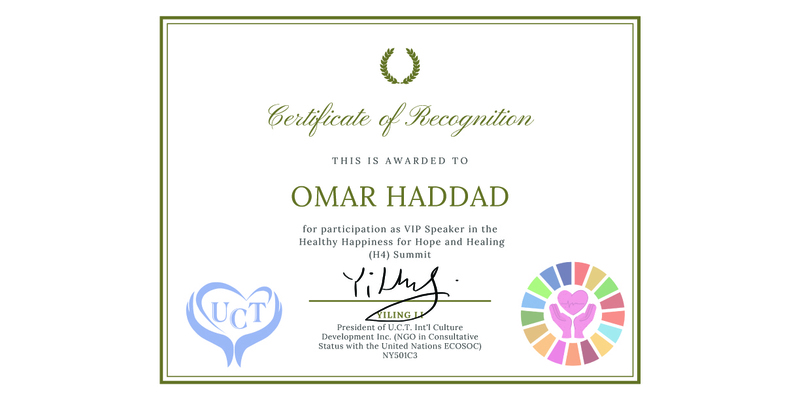 (42,300 visitors in 2017.) Every year during Easter, the whole Polymanga family meets up again to enjoy two-hundred-thousand square feet of facilities providing the best of pop entertainment. For this year 2019, more than 50 guests are planned, concerts, screenings, youtubers, webseries, more than a dozen video games tournaments, a publisher showroom, 4 cosplay parades, karaoke, and lots of other things, not to mention a large shopping gallery. As part of Polymanga 2019, The Joubert Singers, with which I have been a tenor since 2017, will perform anime and American television music themes: that means singing in exotic languages like Japanese and Swahili! Check out the tour packages on Polymanga’s websites. 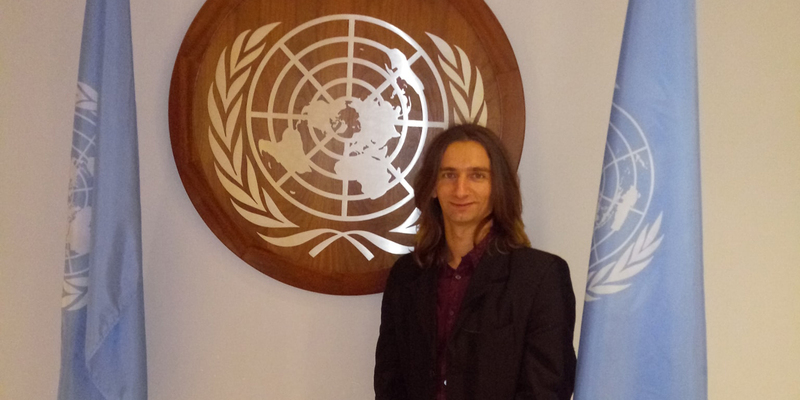 2m2c, Music Convention Center: Avenue Claude Nobs 5, 1820 Montreux - CH, Switzerland. 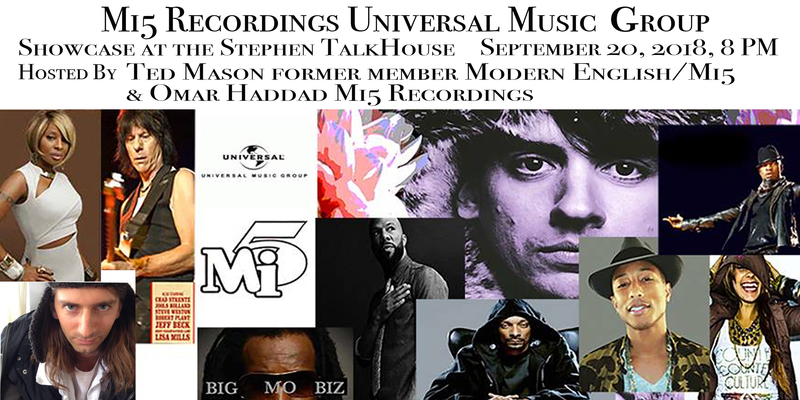 As an A & R, I was super pleased to organize the Mi5 Recordings/Universal Music Group Showcase Night at The Stephen Talkhouse this past September. Performers had the chance to play right in front of (and jam with) music industry executives. President Ted Mason, former guitarist, singer, co-writer/producer, and manager for the British rock band Modern English, hosted the event along with me. 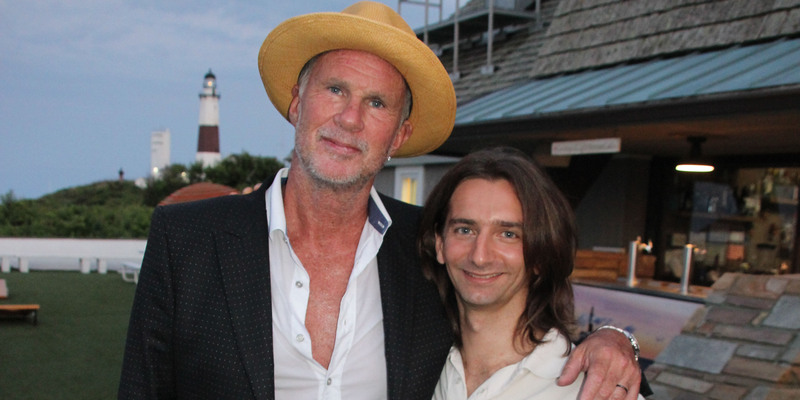 We played Modern English hits and originals, and shared the stage with all the very talented musicians in the Hamptons, Long Island, New York City, and friends of the Stephen Talkhouse (a.k.a. “y’all”), who showed their best material. : 161 Main St., Amagansett, NY 11930. The band’s name is transitioning from THIS to THUS. While the material is being updated, you might see at times one name and at times another. Either way, we hope you keep on enjoying it! Thank you for your patience and for following. October 19 (Fri) 8 to 10 pm. 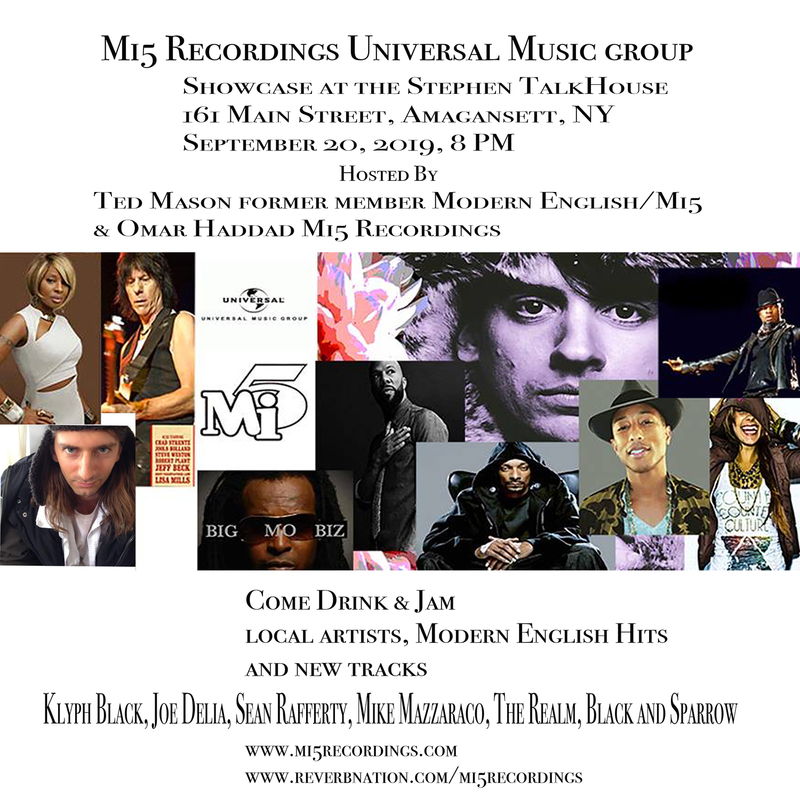 After a successful debut at the legendary Stephen Talkhouse, THUS returns for another show. Bring your friends and have a good time! With Josh LeClerc, Klyph Black, and Anthony Genovesi. May. 19 (Sat) 9 pm to 1 am. 230 Down: 230 Elm Street, Southampton, NY. May. 31 (Thu) 8 to 9 pm. 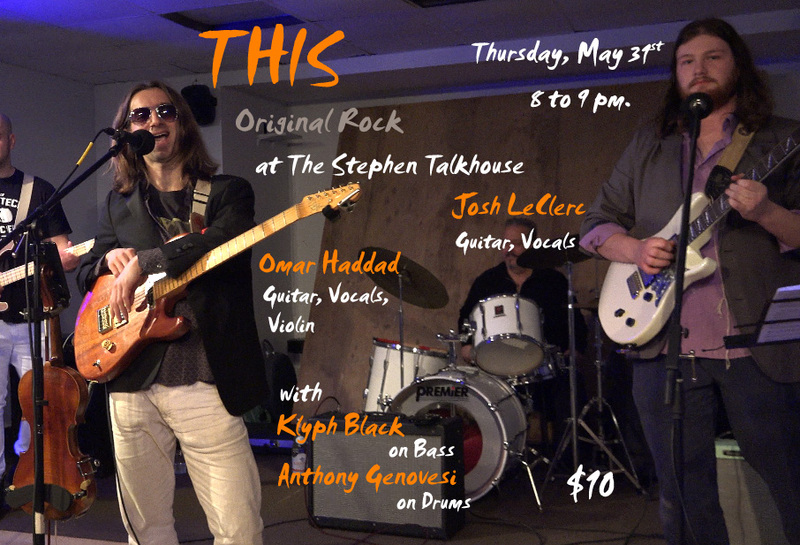 Super excited to be playing at the legendary Stephen Talkhouse, host to so many great acts, and especially thrilled to be sharing the stage with such great talent! Josh LeClerc, Klyph Black, and Anthony Genovesi. Mark your calendars for May 31st this summer, and join us for an hour of originals. We honestly hope that friends and followers can make this show to support the band on this date. It's our debut at the Talkhouse and we really look forward to a great start. Hope to see you there. Bring your friends, and have a good time! We'll be making a video too. Mar. 30 - Apr. 2 All day events. Polymanga is a yearly Swiss convention about Japanese culture, mangas, anime, and video games. Polymanga 2018 offers four days of non-stop entertainment with lots of guests, live concerts, shows, projections, tournaments and shopping. Japan has never been so close! As part of it, The Joubert Singers, with which I have been a tenor since 2017, will perform anime and American television music themes: that means singing in exotic languages like Japanese and Swahili! Check out the tour packages on Polymanga’s websites. Feb. 17 (Sat) 9 pm. to 12 am. Feb. 2 (Fri) 9 pm. to 9:30 pm. Dec. 30 (Sat) 5 to 6 pm. Inner Sleeve Records: 199 Main Street, Amagansett, NY. Oct. 26 (Thu) 7 to 9 pm. The Dog House: 160 W 25th Street (at 7th Ave). Sep. 10 (Sun) 7:30 to 9 pm. The Bowery Electric (Map Room): 327 Bowery, (East Village). Aug. 8 (Tue) at 6:30 to 8 pm. Pianos (Upstairs): 158 Ludlow Street. Aug 3 and 4 (Thu/Fri) at 8:00 pm. One-man theater play by Ralf Precious Gorgeous. In 2012 Ralf Jean-Pierre rode his bicycle 4000 miles across the US performing one-man Shakespeare on the street. Why? Because he was afraid. This play both culminates and tells the story of that trip. Directed by Ralf Jean Pierre and Jolie Tang. GAMBA Forest Gallery: 231 Norman Ave #114, Brooklyn NY 11222. Tickets $15 through Eventbrite, $12 Student, $18 at the door. July 27 and 28 (Thu/Fri) at 8:00 pm. July 20 and 21 (Thu/Fri) at 8:00 pm. July 13 and 14 (Thu/Fri) at 8:00 pm. June 26 (Mon) at 2:30 pm. East Windsor Senior Center: 40 Lanning Blvd, East Windsor, NJ 08520. June 25 (Sun) at 9:00 pm. Nowadays: 56-06 Cooper Ave, Ridgewood, NY 11385. June 12 (Mon) at 8:00 pm. May 26 (Fri) at 10:00 pm. May 16 (Tue) at 8:00 pm. Mar. 14 (Tue) at 7:00 pm. Jan. 16 (Mon) at 8:00 pm. Dec. 6 (Tue) at 7:00 pm. Nov. 5 (Sat) at 6:00 pm. Sep. 18 (Tue) 6 pm. to 7 pm. 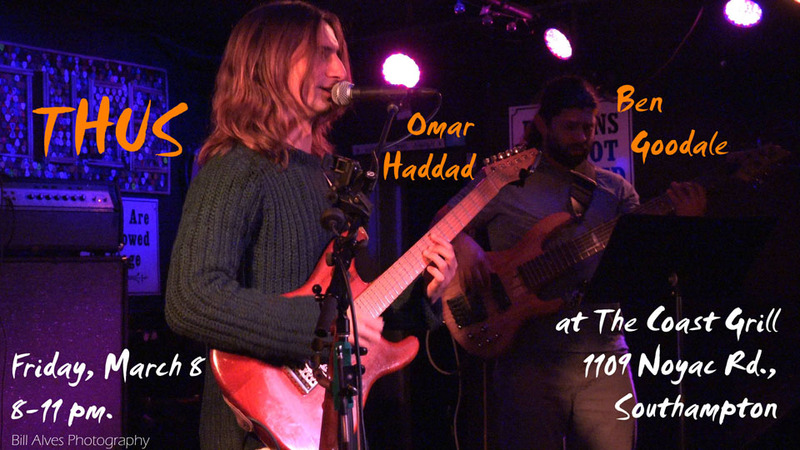 Rattle N’ Hum West: 306 W 39th St.
Aug. 18 (Tue) 6 pm. to 7 pm. Jun. 14 (Tue) 6 pm. to 7 pm. Feb. 16 (Sun) at 8:30 pm. A few weeks ago I had the pleasure to meet radio host Lamon Fenner. Now I’ll have the privilege to be on his show, “Lamon’s Jazz Break at 8”. Lamon is a really nice guy, very nice to hang out with, and I have the feeling you’ll like him a lot. I’ll also have the chance to talk about my upcoming jazz guitar solo album for a bit, and there will be time to preview some of the music before the official release. We hope you can join us! Again, live stream available at 90.5 FM WHCR on Sunday at 8:30 pm. Feb. 8 (Sat) 3:30 to 6:30 pm. 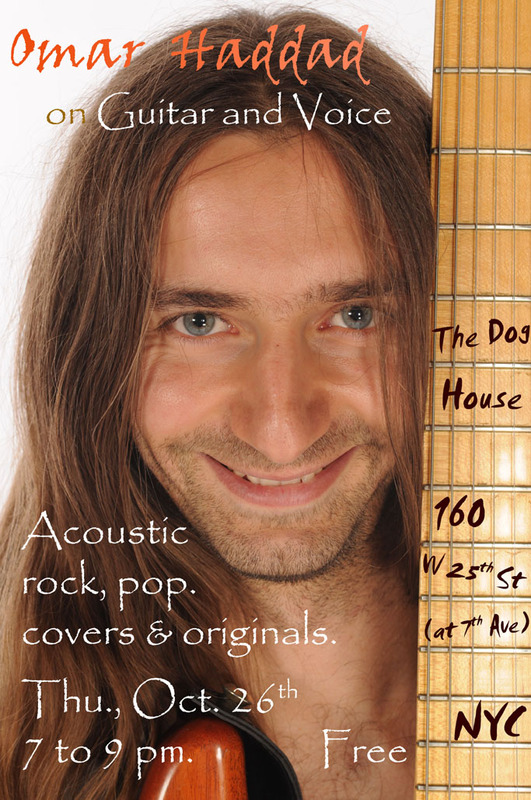 Acoustic rock, pop, folk, country. Come out and join me for an afternoon of music featuring a few originals songs and covers at this cozy and beautiful venue located in one of the most beautiful parts of town, Hill and Dale. Perfect to stop by and have a relaxing time in the middle of a lovely stroll around the Lower East Side! I hope to see you. Hill & Dale: 115 Allen St.
Dec. 29 (Sun) 6 to 8 pm. 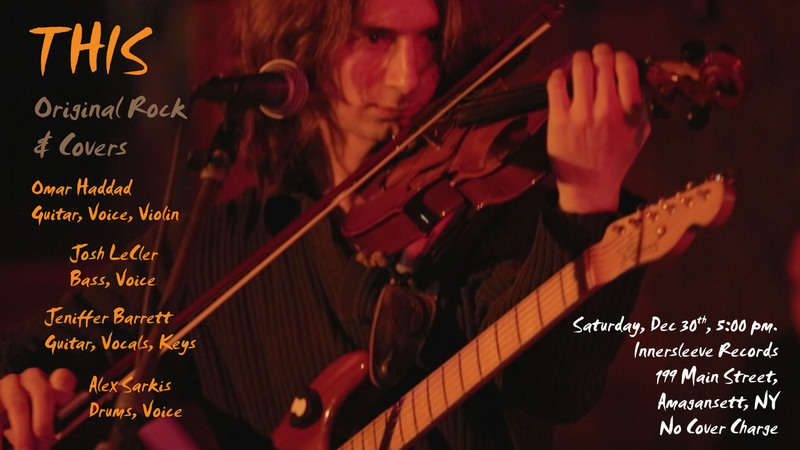 Two full hours of performance including classical music, jazz, and rock n’ roll. It’s also my birthday. Come and celebrate another trip around the Sun with me! Silvana: 300 W 116th St.
Oct. 21 (Mon) 6 to 8 pm. Continuing the work of interpreting Bach on electric guitar, on to jazz, and then Rock & Roll. May 9 (Thu) 6 pm. to 8 pm. Solo performance for the first hour and then I’ll be joined on stage by my wonderful bandmates Antoine Cara, Aaron Kotler, and Louis De Mieulle. May 4 (Sat) 6 to 6:30 pm. Including Mercer, Jobim, and more. 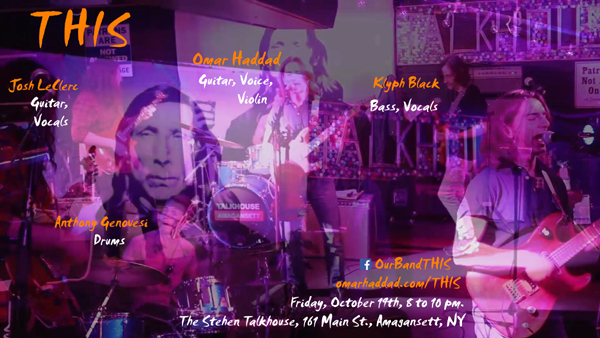 I’m delighted to be a part of Lynette William’s concert series This Is Not The Radio. Her acts are amazing, and I am delighted to be selected among the talents for May 4th Saturday night. Come and enjoy all the performances starting at six and going till late. I have the honor to open the night by being the first act. See you there! Mar. 28 (Thu) 8 pm. to 11 pm. Folks this is going to be a great show, both the 21st and 28th, and I really hope you can join us. We'll be doing high energy covers, and mostly from the eighties (my favorite era, so why not). Come and have a blast with us, 8 pm till late. Mar. 21 (Thu) 8 pm. to 11 pm. Folks this is going to be a great show, both the 21st and 28th, and I really hope you can join us. We'll be playing high energy covers and mostly from the eighties (my favorite era, so why not). Come and have a blast with us, 8 pm till late. Jan 26 (Sat) 6 pm. to 8 pm. Nov. 12 (Mon) 12:30 to 1:30 pm. Sep 29 (Sat) 6 pm. to 8 pm. May 17 (Thu) 7 pm. to 8 pm. March 19 (Mon) 12:30 pm. Feb 16 (Thu) 12:30 pm. Including Mercer, Jobim, Bach, Sor, and more. Continuing the work of interpreting Bach on the electric guitar. There will also be other classical music and jazz. Ene 22 (Dom) 21 hs. Unica Presentacion en Buenos Aires! La Ceremonia en la Radio! Diego y yo tocaremos en vivo y charlaremos del proyecto! Acompañanos, no te lo pierdas! Oct 31 (Mon) 2:30 pm. 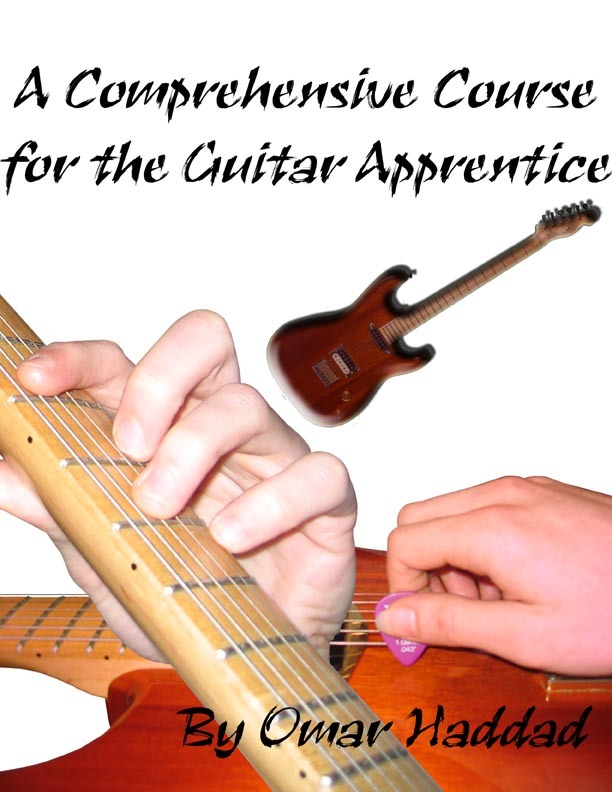 Continuing the work of interpreting Bach on the electric guitar. Oct 11 (Tue) 6 pm to 7 pm. Apr 4 (Mon) 2:30 pm. I will be premiering a project I am very excited about, Bach’s solo lute works performed on electric guitar. There will also be other classical music and jazz. I hope you can join me. Feb 7 (Mon) 6 pm to 7 pm. Dec 9 (Thu) 6 pm to 7 pm. 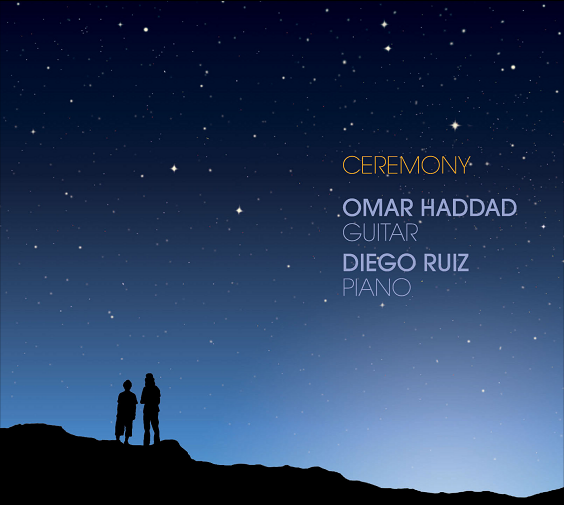 “With sounds that are born in jazz and fuse into the classical, progressive, and Latin realms, this Ceremony is an invitation to rejoice in sound and surrender to the flow of music.” — Alejandro Do Carmo, on Film-Song, Buenos Aires, Argentina.